Multi-channel Digital Marketing involves reaching customers using a multitude of indirect and direct channels including websites, brick-and-mortar stores, direct mail, email, mobile, social, and others. It also encompasses empowering customers to respond and to purchase your product or service using the channels they prefer. The key is choice, as there are more options than ever before for businesses and customers to interact. 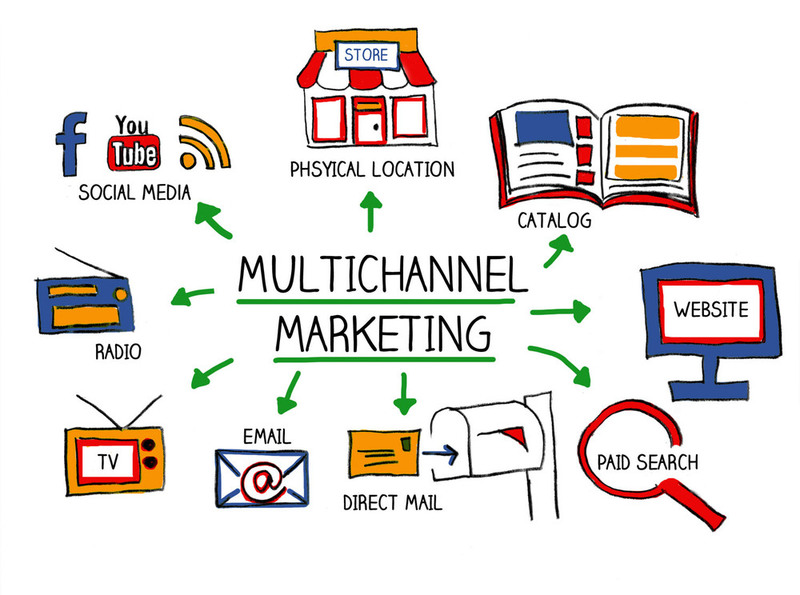 Multi-channel marketing involves reaching customers using a multitude of indirect and direct channels including websites, brick-and-mortar stores, direct mail, email, mobile, social, and others. It also encompasses empowering customers to respond and to purchase your product or service using the channels they prefer. The key is choice, as there are more options than ever before for businesses and customers to interact. As times change and your consumers grow busier, multichannel Digital Marketing is needed to help your business grow. Multichannel marketing (or Omni-channel marketing) is often described as the practice of interacting with consumers using a combination of communication channels. Of course, getting it right will determine your success with it. Companies must be consistent with their messaging and look across devices and channels to avoid confusing or frustrating site visitors. They also need to tailor the messages consumers receive across channels if they are going to make an impact. Remember, consumers have choices, and they can opt to ignore you or block you on one channel if you do not engage them properly. Thus, you need to consider your audience's preferences, demographics, behavioral and transactional history, preferred channel, and current location to fully optimize your strategy. Marketing vs. Strategy. The biggest issue with the term multi-channel marketing is that it doesn't necessarily account for strategy. 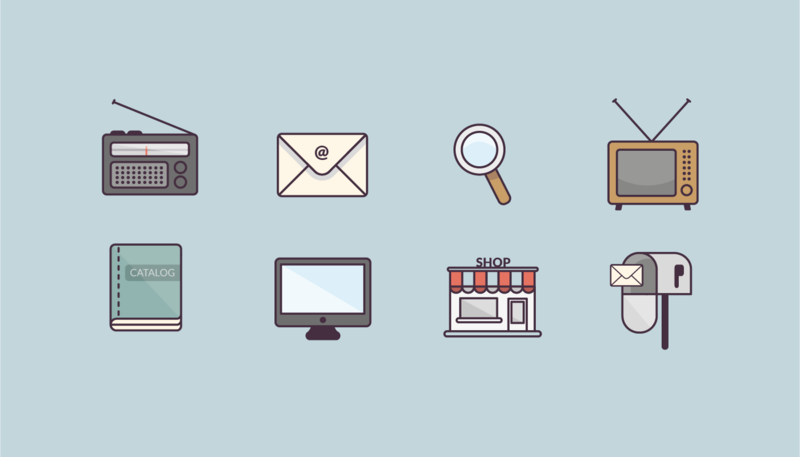 When people think about multi-channel, they simply think about the different mediums used to reach their customers. A multi-channel strategy, on the other hand, considers how customers move and interact across the various platforms. It may seem like semantics but it's an important difference. More Touchpoints = More Complexity. Creating a multi-channel strategy means having a cohesive message across a number of channels, and a continuous evolution of that message as more data is gathered per customer. This often means new tools or data platforms are needed, someone has to be able to understand the data, and all departments have to be constantly aligned. Time & Resources. Just as new tools or software are needed, more time and resources are required to truly build a successful multi-channel marketing strategy. Something not all companies have or are prepared for. Attribution. Who gets the credit for leads and revenue? The email marketing team, the social media team, the search team? Multi-channel marketing without the strategy and right attribution model can lead to confusion, and make it hard for the marketing team to make informed decisions on budgeting and resources. Another challenge is the inability to break down silos. If your data resides in silos, your marketing team cannot have a complete view of customers, their behaviors, or their channel preferences. It is this atomic-level view of the customer that enables companies to personalize and target messaging. Companies that employ multi-channel marketing have a much greater chance of communicating with, and selling to, more customers. This gives them a competitive edge, as consumers have come to expect to have access to companies and information on their own terms. And, customers use multiple channels throughout the purchasing process as they look for information on the company's website via a laptop or smartphone, ask questions on social media, and eventually make the purchase online or in a retail store. In fact, one report by Forbes Insights in association with Synchrony Financial found that customers conduct research online but then make large purchases in stores. According to the report, 46% of retailers claim customers use the internet to research major products but prefer to make actual purchases in person in a store; more than 33% of retailers find that customers conduct research and make purchases online; and 18% of retailers say customers research and purchase in the store. Clearly, customers prefer a cross-channel shopping experience; as a result, companies must meet this demand if they want to stay in the game. There are many benefits of multi-media marketing, and not just in terms of increasing your bottom line but also growing your entire business. Using an array of channels gives you a much wider reach and puts your business in front of new potential customers. More channels means more access to analytical tools that offer data from which you can gauge your campaign's impact. Robust data means your campaigns can become increasingly more intelligent and informed, targeting the right groups at the right time using a combination of channels. When used long-term, multi-media marketing becomes very cost-effective. Campaigns that are highly targeted and easily measured mean you can be sure your ad dollars are being spent in the most efficient way possible so your operational costs are at a minimum. Multi-media marketing allows businesses to engage and interact with audiences frequently. This interaction has the potential to not only reinforce a brand's message but also put a personal face on the company which leads to increased brand loyalty. When you let customers interact with you via the channel of their choice, it makes them happy, and this in turn leads to more completed conversions, which will make you happy. The more touchpoints you have along your sales funnel, the more information you'll collect about your audience and the better able you'll be to craft future campaigns that will be relevant and more persuasive. By using multiple channels your brand message and image stays consistent across all media which allows for more recognition and trust. In today's highly competitive and fragmented marketing landscape one channel is no longer enough. If you want to stay competitive and grow your business you will have to integrate your tactics and tools to reach the masses on their terms and media of choice. Multi-channel marketing must be a way of life if a company is going to survive the screen epidemic; people are connected now more than ever before. Think back to that email you received this morning or the Facebook ad that just so happened to be on your newsfeed. If a company tries to reach you about their annual blowout sale by only using a direct mail marketing piece, chances are there will be a delay. By them sending you a marketing email, you can easily click through to their site while you're at lunch today. If you decide not to purchase now, that's fine because you will later receive a direct mail marketing piece that reiterates "Hey, don't forget about the blowout sale that's happening right now!" Another great thing about multichannel marketing is that it is not industry-specific. So, no matter the industry, if you have a customer-base, using a mix of marketing channels is ideal. This also keeps you from putting all of your eggs (er, marketing) in one basket. By using multichannel marketing to reach your audience, you can reach even more people at once. Some people prefer e-mails while others prefer to read blogs or posts on social media. By using multiple platforms to reach potential customers, you are more likely to reach all of them! It is more powerful. The truth is that people need to see something several times before they take action. If you are reaching people in multiple ways, they are going to see information about your business more often so they are more likely to buy a product or service from you. By using multichannel marketing, you can really see which advertisements are working and which ones aren’t. You will be able to use this data and see what engages your audience so you can hone your advertisements to see better results and achieve goals. By using multichannel marketing, you are able to engage and interact with your customers more often (and in the way that they prefer). Your customers will be happy that you are reachable in many ways. They know that they can easily get in touch with you when needed. Multichannel marketing, when used correctly, is really powerful. You are going to be able to reach even more people than you ever imagined. Also, most people need to see a message more than once or twice for it to stick. By marketing your business in several ways, your customers will see your message a few times so they will be more receptive to it! Most of the biggest and brightest brands like Apple, Disney and Starbucks do multichannel marketing effectively. By using a mix of all the channels we named above, these companies have cleverly dominated their industries. 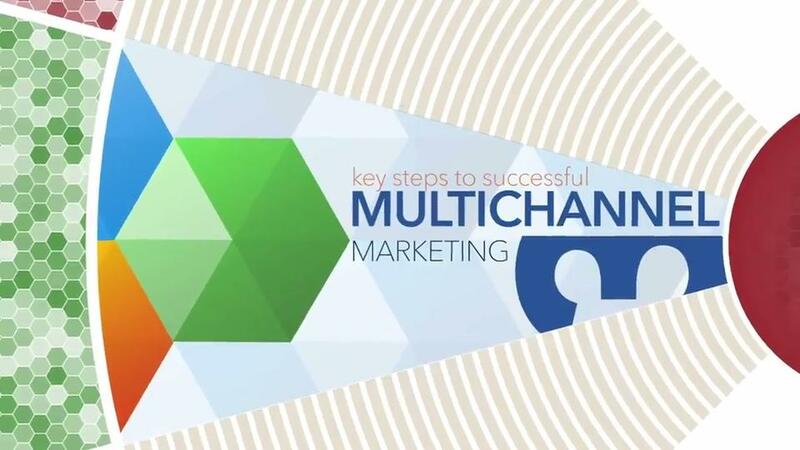 If you are ready to give multichannel marketing a go, here are three great tips you should keep in mind to help your business do it successfully. Know Your Audience �Don't get too wrapped up in the hoopla that is your marketing strategy that you forget about your customers. After all, the point of multichannel marketing is to reach your current and potential customers. Don't lose sight of that. Choose the Right Marketing Channels - Marketing is not one-size-fits-all, so be strategic in the marketing mix you choose. Stay Consistent � This should come without saying, but if you are delivering a message on one channel, think about ways to adapt that same message for the other channels you use. This way, you don't confuse your customers and instead, make it to where each channel works seamlessly together. Integrate Marketing Departments. As mentioned previously, to run a truly successful multi-channel program, departments must be aligned. Break down existing silos to create an integrated marketing team. Understand Your Buyer. To create a multi-channel strategy, you first must understand your buyer. Create personas, talk to actual customers, and create tests on the various platforms, testing messaging, timing, sequences, and more. Establish a Multi-Channel Platform. The goal of your program should inevitably be to create a single customer view that constantly evolves based on data and campaign testing. To do this, you will need to have a platform that consolidates data and allows you to create 1-to1 marketing programs based on said data. Create a Unified Experience. Multi-channel marketing can't just be about getting your message out there in as many places as possible. Give customers a unified and personalized experience across your various marketing channels. We know it takes work, but it'll be worth it in the end. Step 1: Agree on a unified approach and message - It is important before you decide what channels you are going to use that you agree on a consistent message across all channels and create a seamless experience. Marketing channels do not operate independently, and it is important that a consistent brand and message is portrayed across all channels. Step 2: Define your audience - The next step is to define who your audience is and have a clear understanding of their needs, likes, dislikes, and pain points, as well as their communication preferences. What channels do our customers use? Historically, what channels have delivered the best quality of leads? How cost effective is the delivery of our message? How likely is it that the prospect will complete a purchase or become a lead using this channel? Once you have answered the above questions, you should have a good idea of which channels are delivering the best quality leads at the lowest cost. These channels should be your first port of call when developing your multi-channel marketing strategy. Step 4: Create tactical plans for each of the chosen channels - While we will have an overall strategy, the tactical plans for each channel may differ. There should be a detailed plan in place for each channel, and this should be costed and inputted into an overall marketing schedule before being implemented. Step 5: Identify the right Key Performance Indicators - Our strategy doesn't end when the plans are implemented. It is important that we track our performance across each channel and to know where leads came from, as this information can be used to inform future strategies. While multi-channel certainly has its benefits, it is only part of the picture. Yes, multi-channel makes it possible to interact with more prospective customers and at an increased frequency, however, brands must have a strategy to unite the customer experience across these various channels. Enter: omnichannel. As noted above, multi-channel tends to refer to the simple distribution of messages across as many channels as possible, while omnichannel refers to the strategic establishment of a holistic customer experience. Omnichannel marketing is a multi-channel sales approach that provides the customer with an integrated shopping experience. The customer can be shopping online from a desktop or mobile device, via phone, or in a brick-and-mortar store, and the experience will be seamless. Omnichannel marketing focuses on the customers first. It watches their engagement with the brand, uses data to make informed (and often automated) decisions, and optimizes campaigns as they go. 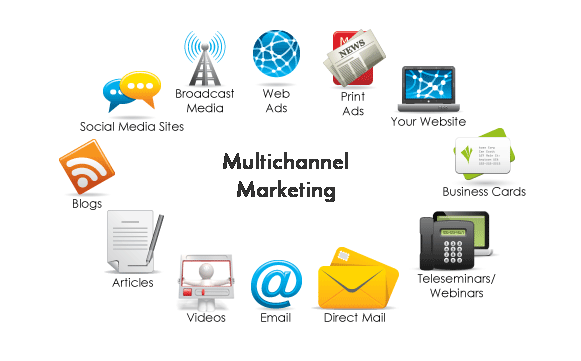 Why is multi-channel marketing important? Great question! The bottom line is, customers are no longer on just one channel. We use our phones while typing on our laptops and watching TV. We ask our friends (both on social media in person) for product recommendations, and before we even think about contacting a company, we do as much research as possible. Customers are more informed than ever, and as marketers we have to make sure we are giving them the information they want, when, and where they want it. Which marketing channels work best together? We'd love to give you a simple answer to this, but it will vary from business to business. We've seen an increase in offline integrating with online (think hashtags on TV shows) and online integrating with offline (car dealership ads on Pandora). The key is creating a strategy that allows you to track the impact each campaign is having, and start to measure which channels work best together. How do I measure multi-channel Digital Marketing efforts? There are a number of steps that will need to be taken, but first and foremost, an agreed upon attribution model will be imperative. Most companies are moving away from first or last touch models and toward W- or U-shaped models. Along with attribution, you will also need to set benchmarks, and measure against those benchmarks until you have a clear understanding of performance. What's the relationship between big data and multi-channel marketing? We hear this question frequently enough that we decided to write a blog post about it. Big data became a major buzzword in the past few years, yet it seems many people still are unsure of how to use it. For marketers, big data can be a challenge, but with the right platform and the right knowledge, it can certainly work in your favor. As customer expectations rise and technology evolves, the shift from multi-channel to omnichannel will become even more important for brands. Customers want a seamless experience, and that experience has to be across multiple platforms. As mentioned previously, while multi-channel allows businesses to reach customers on various platforms, it does not offer the unified experience customers expect. Omnichannel on the other hand, does just that. It may take some time for brands to catch up and siloes to be torn down, but for businesses who want to succeed, they need to shift to an omnichannel strategy. If you get nothing else from this blog remember this – multichannel marketing is no longer a luxury. It's a necessity to help your business grow.